The Beaten Path is a trail in south Montana connecting the Wilderness around the town of Cooke City with the East Rosebud, a drainage on the eastern slope of the Beartooth Mountains. The Beartooths are some of the most biologically diverse mountains on earth and the Beaten Path crosses over a sample of the 944,000 acres that comprise the Beartooth-Absaroka Wilderness Area. The Path, as it is lovingly referred to, is approximately 26 miles though it has been described as long as 31 miles. I suppose it all depends on how much your hiking partner talks and whether he or she is interesting. Red Lodge, Montana is a quaint drinking town with a ski problem about 60 miles south of Billings, Montana and should you choose to hike the Beartooth Mountains, this little western ski town should be your basecamp. The locals call it the Beaten Path because many of them have hiked it…but there are only about two thousand locals in Red Lodge and not all of them are hikers. To folks in Montana, a path anywhere is beaten though The Path does see its share of visitors each summer. Cooke City, an old mining town at Yellowstone’s north east entrance is another cool place to launch day hikes from and in this case should be the starting point for The Beaten Path as beginning near here lends itself to a mostly downhill trek to the East Rosebud. If you are tough enough it can be done in a day. Why you would want to do that is someone else’s guess. There are some locals who have done it. It is a good 4 night hike if you like to do a little fishing with your hiking. There is an abundance of trout in these high country lakes and the trail passes by 14 of them on your way to East Rosebud. I once spent 10 days hiking, fishing and just sitting on rocks along The Beaten Path, it was awesome. If you have no friends or only one car, spend a day in Red Lodge and ask around for a shuttle. It is easy to make friends in Red Lodge. There is Uber and a taxi but it is a long drive to shuttle a car the almost 100 miles from Clark’s Fork Trailhead near Cooke City to the East Rosebud parking lot near Roscoe. Locals are always making runs back and forth up and down the All American Beartooth Highway so you might be able to catch a ride. Shuttling will be part of the adventure. The Clark’s Fork Trailhead is located about 3 miles east of Cooke City off Highway 212. A footbridge takes you across the roaring Clark’s Fork River as it narrowly pours through a spectacular granite draw making waterfalls as mist rises up around you. The elevation here is about 8000 feet. Travel the trail that leads beside Kersey Lake and keep left on the trail traveling towards Russell Lake. I suggest staying at Russell Lake (elevation 8780) the first night, that will make an approximate 6 mile hike. Day Two is about 4 miles to Fossil Lake (elevation 9600). 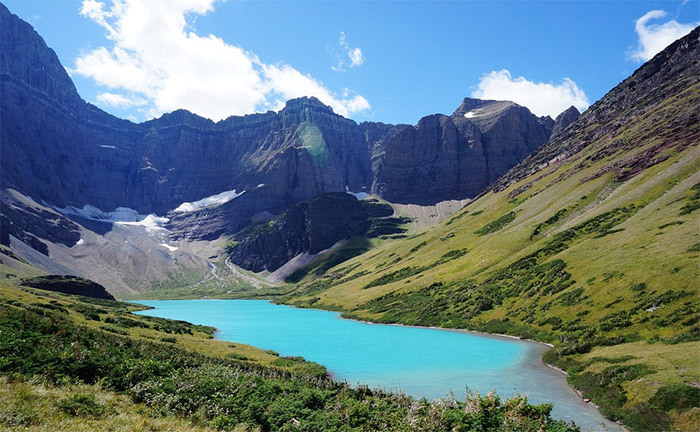 Consider Twin Outlet Lake (elevation 9190) on night three and after a trout dinner and stargazing, hike to Rainbow Lake and spend the last night there (elevation 7670). Yes, there are Rainbows in Rainbow Lake, lots of them as well as Cutthroats. The trail from Fossil Lake to Rainbow Lake is about 10 miles. Spend day five hiking out the final 6 miles to East Rosebud to your car (remember the shuttle adventure) and head to the Grizzly Bar at Roscoe for a celebratory beer. The Beaten Path gives you the feeling of being on top of the world…there, you are not far from it. The fishing is good in most all the lakes along the trail. There are Cutthroat Trout and Golden Trout hybrids, but the fishing is not the star of the show, the stars are. The rock walls, pristine lakes and views of the snow-capped peaks are invigorating. Spending a few nights up there will likely charge you with the sound of wolves howling and the vast open country with star filled nights will remind us all just how tiny we are in this wonderful world. I highly recommend the Beartooth Mountains to anyone looking for a hiking vacation, just choose your hiking partner wisely. Be the first to comment on "Hiking the Beaten Path Trail of the Beartooth Mountains"